A grass-roots movement on social media has been urging women to #WearWhiteToVote in solidarity with the American suffragists, who adopted the color as one of their signatures and fought for what has now come (at least partly) to fruition: the first woman as a major party’s candidate for president. 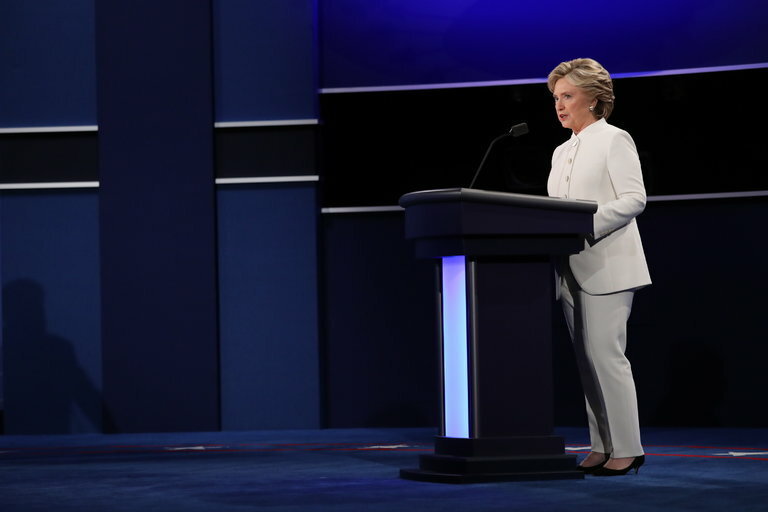 This is not dissimilar to the pantsuitnation movement that emerged on Facebook a few weeks ago, in which women pledged to wear pantsuits to vote in support of that candidate, Hillary Clinton , who has famously adopted the pantsuit as her power uniform, though wear white movement is broader, and references feminist history as much as the current campaign. Other women have already put their words into action, with one 102-year-old combining both movements by wearing a white pantsuit to cast an early vote in Arizona. Likewise, Ellen Cohen, the mayor pro tem of Houston, told the Boston Globe that she and her 101-year-old mother would wear white to vote. Though the discussion around white and the suffragists began in the summer when Mrs. Clinton wore an ivory Ralph Lauren pantsuit to accept her nomination at the Democratic National Convention, both movements really coalesced after her appearance in another white Ralph Lauren pantsuit — with a slightly raised collar and off-center buttons that sparked comparisons to Star Trek and supreme beings — in the third presidential debate in October. Since then the white suit, either as a whole or simply as a white garment, has come to symbolize something greater than merely a piece of clothing. “I was watching the debate with a group of friends, and we all said, spontaneously, ‘That’s a gorgeous suit — I want that suit,’ ” said Marcia Greenberger, co-president of the National Women’s Law Center in Washington. Ms. Greenberger said she and her friends had started talking about how they should all wear white to a fund-raising dinner for the law center as a “sign of solidarity,” and it spiraled from there. The only hitch: No one could get the original Ralph Lauren design, because it had been custom-made for Mrs. Clinton. “I went on the Ralph Lauren website hours ago and can’t find it anywhere!” wrote one unhappy Facebook poster in a private chat. Though a brand spokesman acknowledged “there has been a lot of interest and excitement around her look,” he would not say anything more about whether there were plans to commercialize the suit. That has not, however, deterred the women determined to wear white to honor those who came before. “It started as fun and moved into having all this meaning, both historic and cultural,” said Lisa J. Banks, Ms. Katz’s law partner and a co-founder of their firm. She is not the only one who thinks so. There is precedent for this kind of desire and action, in any case. In 1978 when thousands of women on Washington in support of the Equal Rights Amendment, they did so led by Gloria Steinem and Betty Friedan, with the majority of the marchers wearing white. Ms. Greenberger noted that the law center often suggests that women wear white at public demonstrations. The point is, the women said, that clothing is a symbol that is universally accessible, allowing anyone who can dig up a garment (“Once all I had was white puffer jacket, but that was fine,” Ms. Greenberger said.) to express their commitment and connection to a story greater than their own. As a result, Tuesday may just be the beginning. Ms. Banks said she and her friends planned to find white suits to wear to the if Mrs. Clinton is elected. They are hoping that Ralph Lauren might provide some options, but if not, well, given the demand, there is little doubt someone else will. And then we will see if the area in front of the west side of the Capitol is a sea of white garments once again.